THE low quality of patents granted by the USPTO for a number of decades (still valid, expiry may take 2 decades) has meant that patent trolls lay their hands on software patents, which they can then use to blackmail small businesses (without even a court/legal challenge). Small businesses are harmed the most because of their lack of access to justice (simple matter of economics). 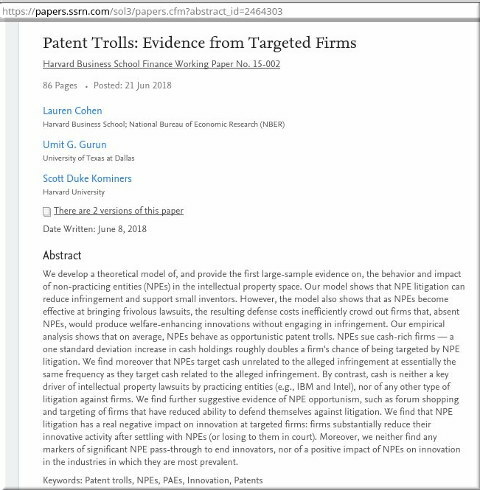 “Small businesses are harmed the most because of their lack of access to justice (simple matter of economics).”Recently, the patent trolls’ lobby, IAM, advertised a huge patent troll called iPEL. The troll tries to market itself as the very opposite of what it is, calling itself “ethical” (even trademarking it!) and portraying itself as an ally of small businesses. The recent launch of a new NPE, iPEL, caused more than a few raised eyebrows among experienced licensing operators. “Who is this guy?” seemed to be the collective response to iPEL’s co-founder Brian Yates who, in launching his new business, has come out swinging for the monetisation fences. His bold talk of a China-focused licensing strategy, backed by a large portfolio of assets from several of the biggest Chinese tech players and a $100 million kitty to play with courtesy of a hedge fund investor, has clearly grabbed a lot of attention. They’re trying the anti-China angle, but in reality it’s just an elaborate plot to tax everyone using patents. IAM seems to have acted like a “media partner” of this elaborate plot, having spoken directly to the people behind this troll, lowered its paywall to increase exposure, and repeated the marketing lies. We develop a theoretical model of, and provide the first large-sample evidence on, the behavior and impact of non-practicing entities (NPEs) in the intellectual property space. Our model shows that NPE litigation can reduce infringement and support small inventors. However, the model also shows that as NPEs become effective at bringing frivolous lawsuits, the resulting defense costs inefficiently crowd out firms that, absent NPEs, would produce welfare-enhancing innovations without engaging in infringement. Our empirical analysis shows that on average, NPEs behave as opportunistic patent trolls. NPEs sue cash-rich firms ― a one standard deviation increase in cash holdings roughly doubles a firm’s chance of being targeted by NPE litigation. We find moreover that NPEs target cash unrelated to the alleged infringement at essentially the same frequency as they target cash related to the alleged infringement. By contrast, cash is neither a key driver of intellectual property lawsuits by practicing entities (e.g., IBM and Intel), nor of any other type of litigation against firms. We find further suggestive evidence of NPE opportunism, such as forum shopping and targeting of firms that have reduced ability to defend themselves against litigation. We find that NPE litigation has a real negative impact on innovation at targeted firms: firms substantially reduce their innovative activity after settling with NPEs (or losing to them in court). Moreover, we neither find any markers of significant NPE pass-through to end innovators, nor of a positive impact of NPEs on innovation in the industries in which they are most prevalent. In view of all this, consider the so-called ‘reform’ proposed by Thomas Massie and Marcy Kaptur, who generally push if not lobby to promote software patents and abolish the Patent Trial and Appeal Board (PTAB). NSBA officials said the Restoring America’s Leadership In Innovation Act, which was introduced by Reps. Thomas Massie (R-KY) and Marcy Kaptur (D-OH), is a necessary, small-business friendly alternative to other harmful patent reform initiatives currently pending before Congress. In 2011, Congress passed and President Obama signed into law the America Invents Act (AIA), which the NSBA said resulted in negative side-effects for small-business innovators and limited their ability to protect their patents from infringement. Actually, the biggest victims of software patents and litigation are small businesses. PTAB is of much use to them (they can even crowdsource/crowdfund an inter partes review (IPR)), so NSBA either does not understand how the patent system works or enlisted many of the parasites (like trolls) as members. “The interests promoted by him aren’t industry’s or even innovation; he’s attempting to change the law in favour of the litigation ‘industry’, i.e. those preying on actual scientists and holding innovation back.”Sadly, the likes of Massie and Kaptur might actually believe that they are helping, boosted by these lies about US lost leadership in "innovation" — a myth further perpetuated (disappointingly) by IP Watch yesterday. Amplifying WIPO and its new propaganda (whose purpose seems to be increasing patents and billionaires’ protectionist laws), IP Watch speaks of something called “Global Innovation Index 2018″. How was it measured? Patents?